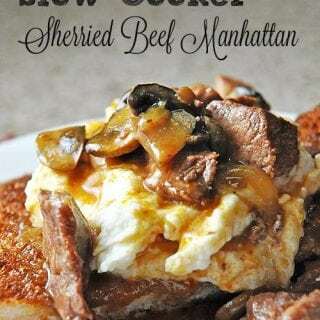 Sherried Beef Manhattan - Recipes That Crock! Did you always enjoy Beef Manhattan as a child? 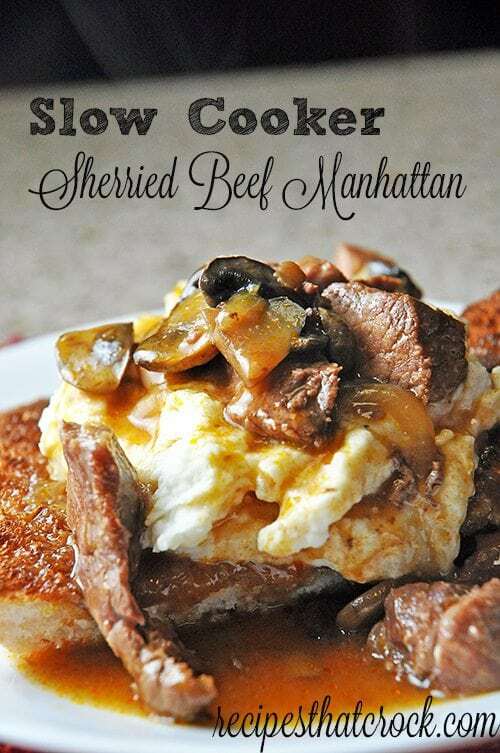 This recipe for Sherried Beef Manhattan is the perfect grown up version of the childhood favorite, that the kids will still love. Flavorful beef and mushrooms on a bed of creamy mashed potatoes atop a toasted piece of French bread… delish! The best part of this delicious dish is that the hard work is done all on it’s own– in the crock pot! You literally dump all of the ingredients for the beef in the slow cooker on low for 8-10 hours. Then, when it is time for dinner, toast up some bread, heat up some mashed potatoes (these are serious good and super quick) and dinner is ready in 10 minutes! Sherried Beef Manhattan inspired by Gooseberry Patch's Hometown Christmas. Mix all ingredients (except bread and mashed potatoes) in a crock pot. 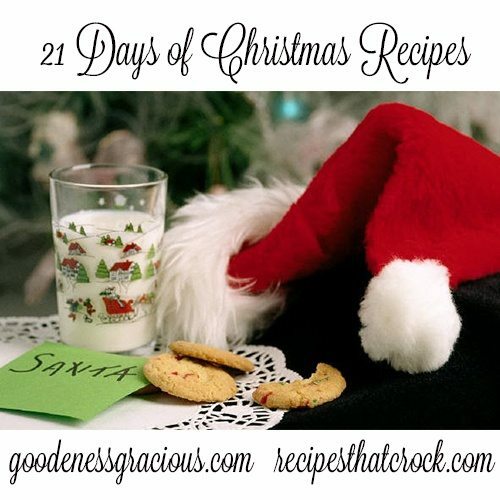 This post is a part of our celebration of 21 Days of Christmas Recipes with Gooseberry Patch and our sister site GoodenessGracious.com. I am seriously salivating on my keyboard! 🙂 I saw this picture on one of your posts a few days ago and have been patiently waiting for the recipe! I can’t wait to try it! I have a question though. I’ve always wanted to try cooking with sherry, but never have because I haven’t before and I don’t drink it so I never know what to buy. Even if someone says, just cook with something you would drink (I’ve heard this about red and white wines), I still wouldn’t know what brand to buy, etc. Any suggestions? What brand/kind do you use in this recipe? I just use the cooking wines from the same aisle as the flavored vinegars. I am no wine expert, so if I can’t find it there, I just grab what I can find in the wine aisle. Sorry I am not much help! Enjoy!